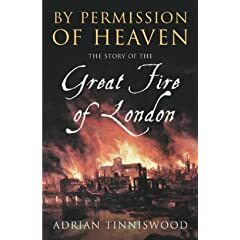 Just finished reading Adrian Tinniswood’s history of the great fire of London, By Permission of Heaven published by Pimlico. Came across it in a discount book shop but I’d have been happy to have paid full price. It’s starts with a fascinating day by day account of the fire itself and then moves onto the aftermath and the rebuilding of London. I found the details of the rumours of foreign and Catholic agents starting the fire and the rumours’ repercussions particularly interesting having never read about them before. The chapter on the trial of Robert Hubert, who confessed to starting the fire and who despite contradicting his own account from one telling to the next is particularly poignant. By Permission of Heaven: The Story of the Great Fire of London is available from Amazon.